You know the drill: boy falls in love with girl, boy asks girl to marry him, girl says yes(! ), boy asks best friend to plan his bachelor party, best friend decides to book a guys weekend including: a bungalow at The Lafayette, Cards Against Humanity and a brewery tour. I called up Summer at Brew Hop to set up the bachelor party brewery tour. With more than 80 breweries throughout the county, it can be hard to narrow it down to just 3 stops. Thankfully, Summer spent a good amount of time with me working out the perfect schedule. I really wanted to make Societe Brewing a stop along with Ballast Point Scripps Ranch/Old Grove since the groom’s brother lived in that area. We finally decided on a route that optimized our time and included 3 great San Diego breweries: Societe, Ballast Point and Helm’s. Want to make the groom (and the groomsmen) feel like a VIP? Just have Summer pull up in the luxurious Brew Hop Escalade with a cold beer waiting for him inside. The six of us loaded ourselves into the SUV, took heed of the safety and decorum speech (you are on the tour to have fun, not be a drunken jerk) and headed off to our first stop. Toasting the groom while enjoying amazing beer from Societe Brewing Co. It did not take long for Societe to become one of San Diego’s most popular breweries. It’s head brewers Travis Smith and Doug Constantiner spend most of their time focusing on perfecting their good ol’ fashioned house beers. You won’t find any crazy concoctions here, just delicious and flavorful classic brews. We pulled up to one of the tables and Summer brought forth plenty of samples based on individual tastes ranging from IPAs, to ales to stouts. After a few tasters, we had the chance to go behind the scenes to tour the brewery and learn about the brewing process while still enjoying their amazing brews. The big question when leaving Societe is are you on #TeamApprentice or #TeamPupil? 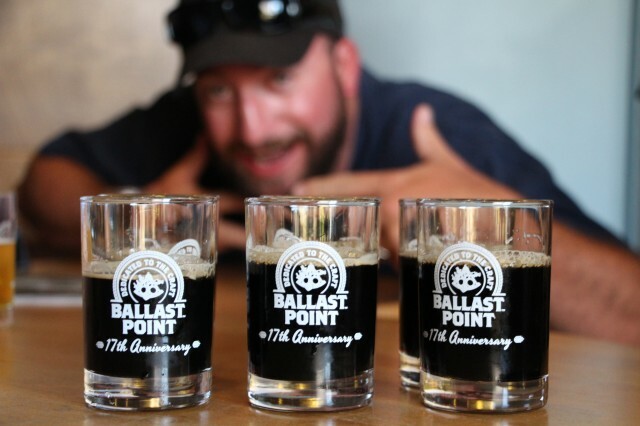 > Find out more about Societe Brewing Co.
Ballast Point is a San Diego beer institution. If you have never had a Sculpin IPA, you need to rush out and find one. You can thank me later! Summer knew that since our party comprised of all local boys and the we had had our fair share of Ballast Point beers, she selected some of the more interesting brews included a few spicy/chili-infused beers. One of the aspects that makes San Diego beers so interesting is the experimentation that brewers are willing to try with spices and even peanut butter (check out Karl Strauss’ Beer Week special release). Since the place was packed we were unable to take a tour of the brewery but that was just fine since we still had plenty of samples to try before moving onto the last stop. If you are also into craft spirits, Ballast Point offers daily tastings at the Old Grove location. Our last stop was Helm’s Brewing and we took a few minutes to check out the freezer…since it was so hot outside! 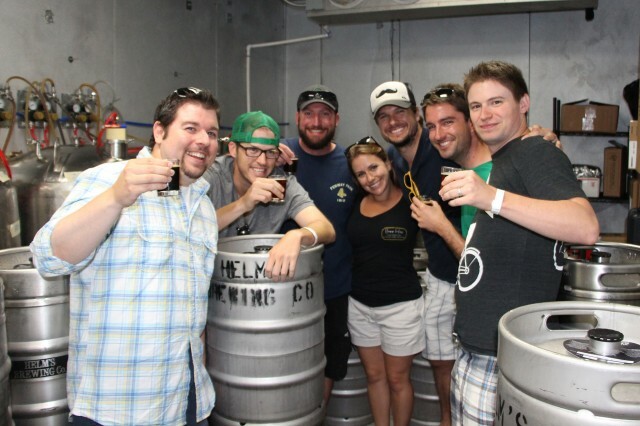 Our final stop on the brewery tour took us to one of San Diego’s newer breweries, Helm’s Brewing Co. There I discovered the amazing Hop the RIPA, a red India Pale Ale, and the seasonal Samuin Harvest, a spiced beer that tasted like autumn (trust me on this one). Since we were with Brew Hop, one of the owners stopped by to say hello and spent some time chatting with us about the brewery and the business behind running one. It was fascinating to learn what it took to go from home brewing in a garage to a fully armed and operational brewery. > Find out more about Helm’s Brewing Co.
As we headed back to the bungalow in North Park, we enjoyed our slight giddiness by trying to decide the best beer of the day. Of course, we could not choose a winner since we each have different tastes. For one friend it was “The Butcher” at Societe, for another it was Ballast Point Black Marlin with Chipotle, for me it was Hop the RIPA. However, that’s the beauty of a brewery tour, everyone will find a beer they enjoy all while having a great time. So what are you waiting for? 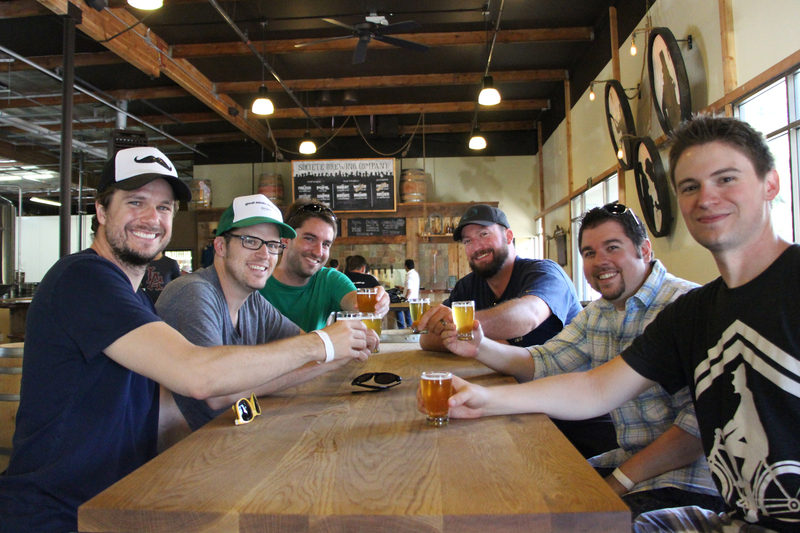 Book your brewery tour today and explore San Diego’s Craft Beer! 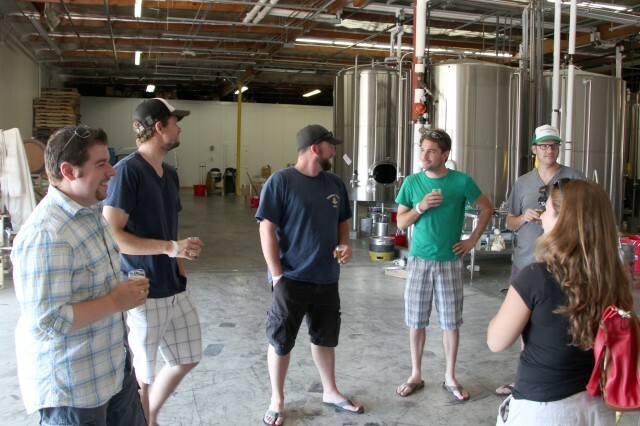 Other brewery tour companies include Brewery Tours of San Diego and San Diego Beer and Wine Tours. > Read about my Beer Train Tour with SD Beer and Wine Tours. To top things off, a contest winner took the brewery tour right before ours! Make sure you follow us on Facebook, Twitter, and Google+ to never miss another chance to win a San Diego prize package. This entry was posted in Culinary, Tours & Sightseeing and tagged beer, craft beer, north county inland, SDBeer by Brent Bernasconi. Bookmark the permalink.